I’ve just returned from a family holiday in Greece. It made me realise how spending time away with loved ones and not doing very much is really important from time to time. Being in Greece also reminded me that the simplest food and service is often the best. We often overcomplicate things for no reason at all. While we were there, we discovered this amazing restaurant called Glyfa Taverna Nissaki Corfu. Right on the water, people come along in boats, moor up and clamber into the restaurant, have a great lunch or dinner, then head back out on the water again. It’s an amazing lifestyle. The owner has had the restaurant for 20+ years and his mother is the chef. Every dish was simple, fresh and full of flavour. 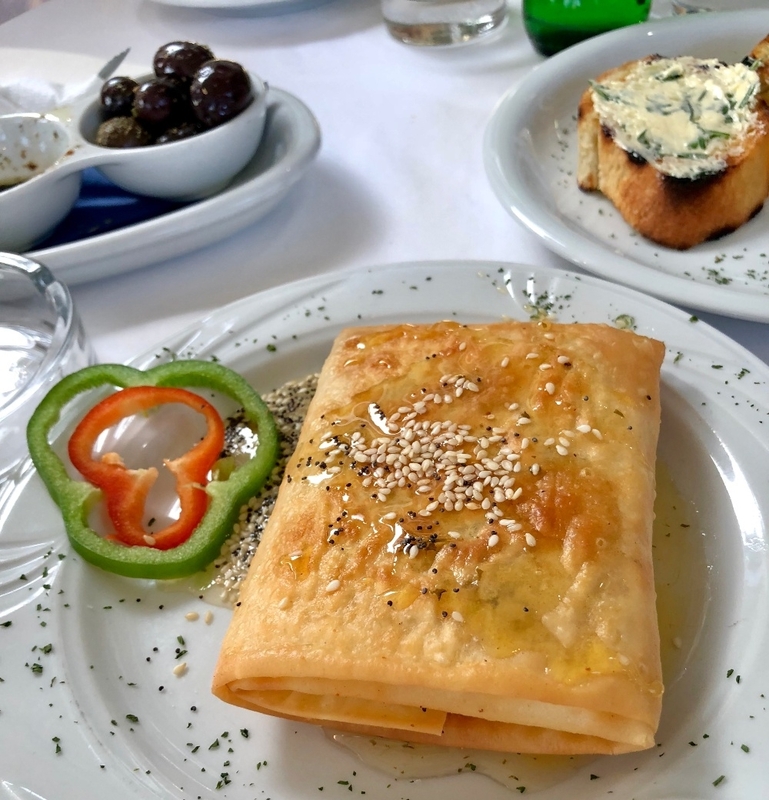 My absolute favourite dish of the trip was feta wrapped in filo with honey. It was so simple but it totally captured me. It was warm and crisp from the outside, but the inside was filled with this salty ten-year-aged feta. Warm honey was poured over the top. It was remarkable – so much so that I wouldn’t share it with anyone else! The honey theme continued when I returned to work, as I went to a tasting event by Bermondsey Street Bees with our fundraiser Ed. It was part of the Love Lunch series by Team London Bridge – a community organisation which has helped us promote our work a lot. I’ve hosted quite a few Love Lunch sessions, where we invite people in, tell them a bit about what we do and cook them some lunch. It’s all about spreading the word in the community, but in nine years of being in London Bridge, I’ve never actually attended one! So it was a great opportunity to learn about another business in the local area. I didn’t know Bermondsey Street Bees existed. They have a tiny shop on Bermondsey Street, where they’ve also got eight hives on the roof. Plus they have another 100 hives across London and various parts of the UK. It’s run by husband and wife team Dale Gibson and Sarah Wyndham Lewis. Dale is the head beekeeper and Sarah – who is ironically allergic to bee stings – is a passionate honey sommelier. They’re very enthusiastic about the sustainability of bees and what they do for the world. We tasted around 15 different varieties of honey and each one was fantastic. It also really brought to my attention the poor quality and unremarkable honey you get in supermarkets. When you taste proper raw honey that hasn’t been pasteurised or homogenised, it’s a totally different ball game. In fact, the majority of honey the supermarkets sell isn’t even proper honey – it’s just sugar. Because so much honey has to be produced to meet demand, they just pour sugar into the hives, rather than letting the bees find their own nectar. This is the same reason why you find desert honey – there’s no nature in the desert that is useful to bees, so they pour sugar into the hives so honey can still be produced. I’ve also been a real advocate of manuka honey for a number of years, but I learned that nine times more manuka honey is sold than can actually be properly made. So what people are buying and spending a fortune obviously isn’t always of the quality they’d expect. What it shows is that buying things locally when you know where the ingredients have come from really does make a difference. And as Bermondsey Street Bees shows, it’s even possible to do this in the heart of the city. The honey they produce from week to week changes depending which flowers are blooming – it’s really incredible. One of my favourites was the Exmoor Heather Honey. I’ll be doing a supper club at The Conduit on 26 September, where I’ll be recreating the feta cheese filo recipe from my holiday, using some of this honey. Bermondsey Street Bees also kindly offered to run a honey tasting course for our apprentices, and I’m really looking forward to them tasting what real honey is like for themselves. This week's recipe is a feta + filo with honey recipe, inspired by my trip to Greece.